Recently completed the Settlement Music School is up and running (and our newest neighbor) here in Willow Grove. The oldest continuously operating Music School in the United States Settlement Music School was full operational in January 2011. The three story building (25,000 gsf) will provide for new music classrooms, office and administration spaces, and a three hundred seat recital hall. Settlement Music School expects this new facility will accommodate over 1,000 students by 2013. 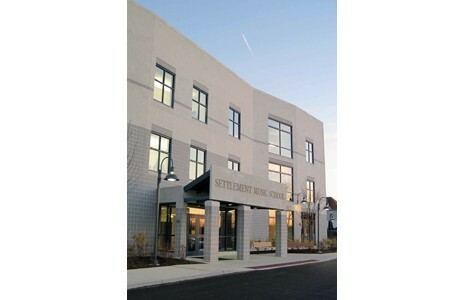 AHAdams&Company provided technical consulting services for design development and construction documentation for the new Settlement Music School. From initial design concepts AHAdams&Company developed the necessary acoustical performance requirements and worked with the acoustical consultant to integrate construction assemblies and optimize building systems to achieve the goal of undistorted musicial sound quality as part of the overall building performance requirements. The design architect and Settlement Music School Board member George von Scheven, was also Arthur Hall Adams teacher as an undergraduate in the architecture program at Drexel University.